Group D of UEFA Euro 2012 began on 11 June 2012 and ended on 19 June 2012. The pool was made up of Ukraine, Sweden, France and England. The top two teams, England and France, progressed to the quarter-finals to play Italy and Spain respectively, while Ukraine and Sweden were eliminated from the tournament. On the second matchday, on 15 June, the match between Ukraine and France that began at 19:00 local time was interrupted by heavy rainfall and a thunderstorm. The conditions forced the referee to suspend the game during the fifth minute, and play was only resumed 58 minutes later. UEFA therefore delayed the match between Sweden and England to kick off 15 minutes later than originally scheduled, instead beginning at 22:00 local time, to avoid the matches overlapping. On the final matchday, on 19 June, the match between England and Ukraine featured a ghost goal by Marko Dević. In the second half, with Ukraine losing 1–0 to a Wayne Rooney goal, Dević's shot was hooked clear from behind the England goal-line by John Terry under the eyes of the additional assistant referee standing beside the goal (as confirmed by video replays). The incident reopened football's goal-line technology debate. While replays showed the match officials failed to spot that Artem Milevskiy was in an offside position in the build-up to Dević's ghost goal, UEFA and its chief refereeing officer Pierluigi Collina admitted on the following day that an error had been made and that Ukraine had been denied a legitimate goal. Ukraine finished third ahead of Sweden based on their head-to-head record (2–1). ↑ Burke, Chris (15 June 2012). "France find their stride to pick off Ukraine". Union of European Football Associations. ↑ Dawkes, Phil (15 June 2012). 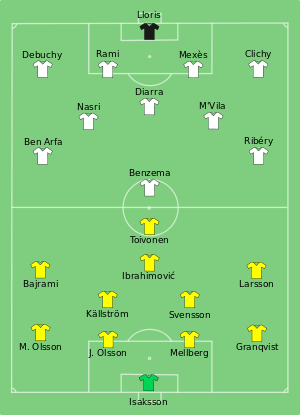 "Euro 2012: Sweden v England". BBC Sport. British Broadcasting Corporation. ↑ Barlow, Matt (19 June 2012). "Ghost goal fury of Blokhin while Hodgson's happy to get rub of the green". Daily Mail. Retrieved 19 June 2012. ↑ "5 Famous Soccer Goal-Line Controversies". The Washington Post. 19 June 2012. Retrieved 19 June 2012. ↑ "England, France through to Euro 2012 quarters". Herald Sun. 20 June 2012. Retrieved 20 June 2012. ↑ Tidey, Will (19 June 2012). "Ukraine vs. England: Marko Devic Enters Goal-Line Technology Hall of Shame". The Bleacher Report. Retrieved 19 June 2012. ↑ "Rooney seizes his chance to lift England's expectations". The Independent. 20 June 2012. Retrieved 20 June 2012. ↑ "Euro 2012: Uefa admits Ukraine were deprived of a goal against England". The Guardian. 20 June 2012. Retrieved 20 June 2012. ↑ "Euro 2012: Ukraine goal crossed the line and should have been given says Uefa referee chief Pierluigi Collina". The Daily Telegraph. 20 June 2012. Retrieved 20 June 2012. 1 2 "Full-time report France-England" (PDF). Union of European Football Associations. 11 June 2012. Retrieved 11 June 2012. 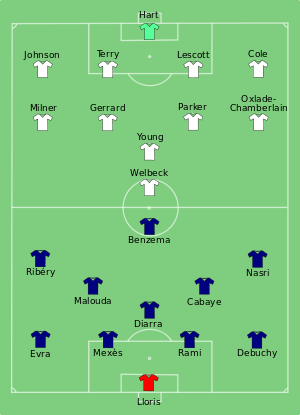 1 2 "Tactical Line-up – Group D – France-England" (PDF). UEFA.com. Union of European Football Associations. 11 June 2012. Retrieved 11 June 2012. ↑ "Full-time report Ukraine-Sweden" (PDF). Union of European Football Associations. 11 June 2012. Retrieved 11 June 2012. 1 2 "Tactical Line-up – Group D – Ukraine-Sweden" (PDF). UEFA.com. Union of European Football Associations. 11 June 2012. Retrieved 11 June 2012. ↑ Haslam, Andrew (11 June 2012). "Shevchenko double gives Ukraine debut victory". UEFA.com. Union of European Football Associations. Retrieved 12 June 2012. 1 2 "Full-time report Ukraine-France" (PDF). Union of European Football Associations. 15 June 2012. Retrieved 15 June 2012. 1 2 "Tactical Line-up – Group D – Ukraine-France" (PDF). Union of European Football Associations. 15 June 2012. Retrieved 15 June 2012. 1 2 "Full-time report Sweden-England" (PDF). Union of European Football Associations. 15 June 2012. Retrieved 15 June 2012. 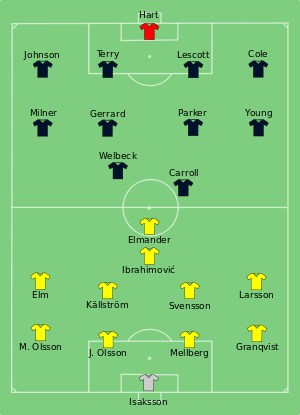 1 2 "Tactical Line-up – Group D – Sweden-England" (PDF). Union of European Football Associations. 15 June 2012. Retrieved 15 June 2012. 1 2 "Full-time report England-Ukraine" (PDF). Union of European Football Associations. 19 June 2012. Retrieved 19 June 2012. 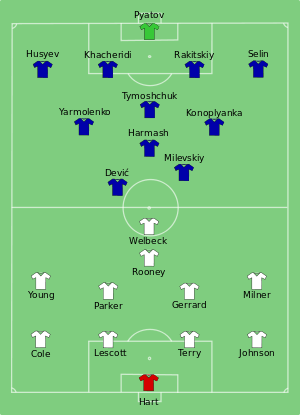 1 2 "Tactical Line-up – Group D – England-Ukraine" (PDF). UEFA.com. Union of European Football Associations. 19 June 2012. Retrieved 19 June 2012. 1 2 "Full-time report Sweden-France" (PDF). Union of European Football Associations. 19 June 2012. Retrieved 19 June 2012. 1 2 "Tactical Line-up – Group D – Sweden-France" (PDF). UEFA.com. Union of European Football Associations. 19 June 2012. Retrieved 19 June 2012.